“Spatio-Temporal Video Analysis and Visual Activity Recognition” at the Iberian Conference on Pattern Recognition and Image Analysis (IbPRIA) 2011 Conference in Las Palmas de Gran Canaria. Spain. June 8-10. My research group is focused on a variety of approaches for (a) low-level video analysis and synthesis and (b) recognizing activities in videos. In this talk, I will concentrate on two of our recent efforts. One effort aimed at robust spatio-temporal segmentation of video and another on using motion and flow to recognize and predict actions from video. In the first part of the talk, I will present an efficient and scalable technique for spatio-temporal segmentation of long video sequences using a hierarchical graph-based algorithm. In this work, we begin by over segmenting a volumetric video graph into space-time regions grouped by appearance. We then construct a “region graph” over the obtained segmentation and iteratively repeat this process over multiple levels to create a tree of spatio-temporal segmentations. This hierarchical approach generates high quality segmentations, which are temporally coherent with stable region boundaries, and allows subsequent applications to choose from varying levels of granularity. We further improve segmentation quality by using dense optical flow to guide temporal connections in the initial graph. I will demonstrate a variety of examples of how this robust segmentation works, and will show additional examples of video-retargeting that use spatio-temporal saliency derived from this segmentation approach. (Matthias Grundmann, Vivek Kwatra, Mei Han, Irfan Essa, CVPR 2010, in collaboration with Google Research). In the second part of this talk, I will show that constrained multi-agent events can be analyzed and even predicted from video. Such analysis requires estimating the global movements of all players in the scene at any time, and is needed for modeling and predicting how the multi-agent play evolves over time on the playing field. To this end, we propose a novel approach to detect the locations of where the play evolution will proceed, e.g. where interesting events will occur, by tracking player positions and movements over time. To achieve this, we extract the ground level sparse movement of players in each time-step, and then generate a dense motion field. Using this field we detect locations where the motion converges, implying positions towards which the play is evolving. I will show examples of how we have tested this approach for soccer, basketball and hockey. 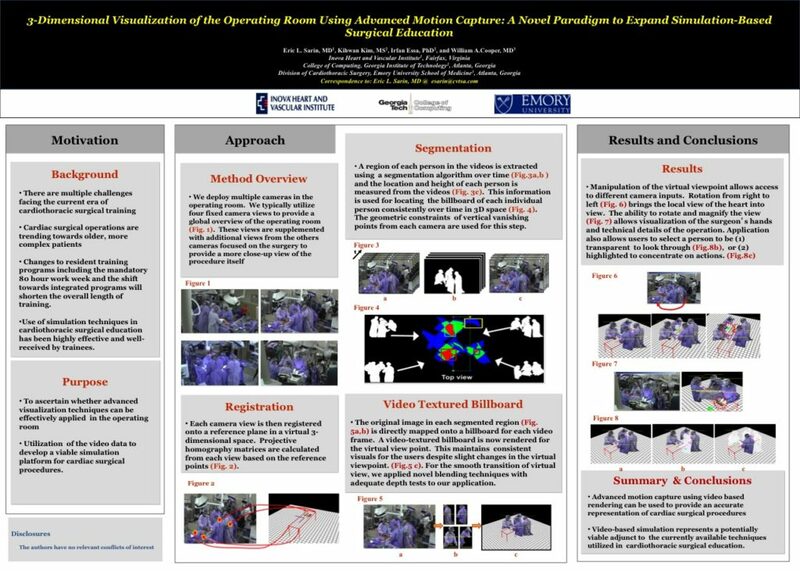 (Kihwan Kim, Matthias Grundmann, Ariel Shamir, Iain Matthews, Jessica Hodgins, Irfan Essa, CVPR 2010, in collaboration with Disney Research). Time permitting, I will show some more videos of our recent work on video analysis and synthesis. For more information, papers, and videos, see my website. We introduce methods for augmenting aerial visualizations of Earth (from tools such as Google Earth or Microsoft Virtual Earth) with dynamic information obtained from videos. Our goal is to make Augmented Earth Maps that visualize plausible live views of dynamic scenes in a city. We propose different approaches to analyze videos of pedestrians and cars in real situations, under differing conditions to extract dynamic information. Then, we augment an Aerial Earth Maps (AEMs) with the extracted live and dynamic content. We also analyze natural phenomenon (skies, clouds) and project information from these to the AEMs to add to the visual reality. Our primary contributions are: (1) Analyzing videos with different viewpoints, coverage, and overlaps to extract relevant information about view geometry and movements, with limited user input. (2) Projecting this information appropriately to the viewpoint of the AEMs and modeling the dynamics in the scene from observations to allow inference (in case of missing data) and synthesis. We demonstrate this over a variety of camera configurations and conditions. (3) The modeled information from videos is registered to the AEMs to render appropriate movements and related dynamics. We demonstrate this with traffic flow, people movements, and cloud motions. All of these approaches are brought together as a prototype system for a real-time visualization of a city that is alive and engaging. A collaborative project between School of Interactive Computing, Georgia Institute of Technology, Atlanta, Georgia, Division of Cardiothoracic Surgery, Emory University School of Medicine, Atlanta, Georgia, and Inova Heart and Vascular Institute1, Fairfax, Virginia. This was a Video and a Poster presentation at the Society of Thoracic Surgeons Annual Meeting in San Diego, CA, Jan 2011. Kihwan Kim, Matthias Grundmann, Ariel Shamir, Iain Matthews, Jessica Hodgins, Irfan Essa (2010) “Motion Field to Predict Play Evolution in Dynamic Sport Scenes” in Proceedings of IEEE Computer Vision and Pattern Recognition Conference (CVPR), San Francisco, CA, USA, June 2010 [PDF][Website][DOI][Video (Youtube)]. Raffay Hamid, Ram Krishan Kumar, Matthias Grundmann, Kihwan Kim, Irfan Essa, Jessica Hodgins (2010), “Player Localization Using Multiple Static Cameras for Sports Visualization” In Proceedings of IEEE Computer Vision and Pattern Recognition Conference (CVPR), San Francisco, CA, USA, June 2010 [PDF][Website][DOI][Video (Youtube)]. We present a novel approach for robust localization of multiple people observed using multiple cameras. We usethis location information to generate sports visualizations,which include displaying a virtual offside line in soccer games, and showing players’ positions and motion patterns.Our main contribution is the modeling and analysis for the problem of fusing corresponding players’ positional informationas finding minimum weight K-length cycles in complete K-partite graphs. To this end, we use a dynamic programmingbased approach that varies over a continuum of being maximally to minimally greedy in terms of the numberof paths explored at each iteration. We present an end-to-end sports visualization framework that employs our proposed algorithm-class. We demonstrate the robustness of our framework by testing it on 60; 000 frames of soccerfootage captured over 5 different illumination conditions, play types, and team attire. We have the following 4 papers that have been accepted for publications in IEEE CVPR 2010. More details forthcoming, with links to more details.